More Bell’s Brewery cans on the way! (Comstock, MI) – Following the successful launch of Two Hearted and Oberon Ale in 16 oz. 4-packs, we are proud to announce and share the look of the rest of our seasonal lineup in cans. Best Brown Ale, Winter White and Smitten Golden Rye Ale will be available in cans for the first time later this year and early next year. All three seasonal beers will continue to be available on draft and in both 6-pack and 12-pack bottles. “We love being able to offer these brands in both cans and glass to suit the various lifestyles of our customers and fans,” said Laura Bell, Bell’s Brewery Vice President. Best Brown Ale will be Bell’s third can offering and will be available along with bottles and on draft beginning around Labor Day. All three seasonal beers will be available in the same 16 oz. 4-packs. 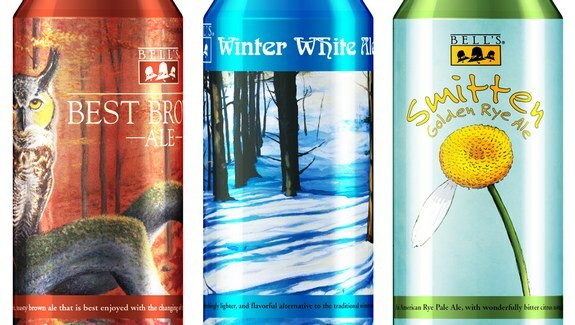 Cans of Winter White will be released in November and Smitten will return in February. Founder’s Double Trouble back this week!